When I was a little girl, my friend H and I sold posies of flowers outside our local pub. We would sing "po-sies for sale!" with our most charming smiles as people arrived, our wares arranged on a cloth draped over the stone wall by the entrance. We happened to both buy the same blue velvet dress with a peter pan collar from M&S and we would co-ordinate for extra effect on our unsuspecting customers. The cute factor sold. One year - I think it was when I was 7 or 8 - I made £50 over the summer. Earlier in the day, we would meet at her house and go off to our den to play. About a five minute walk along the tall, hedged lanes there was a hidden exit off the road to the stream. If you waded across, there was a huge oak tree that had grown horizontally in a U shape and then upwards. The U faced upstream and would collect debris as the water flowed past. Every spring we would clear it out. I usually pretended that the U was a kitchen countertop and would prepare foraged (inedible, probably poisonous) meals on flat rocks, then wash up in the stream. We would then go on a huge clipping trip around her garden, harvesting wild and cultivated flowers. I particularly remember the scent of the lily of the valley, tucked into a quiet, shady corner. We'd then arrange them into various small posies and wrap the stems with wet kitchen roll and foil to stop them wilting. Now I look back, I'm so grateful that I had those wild times - playing on our own, out of hearing distance, in the streams, gardens, fields and pub car parks of Devon. I imagine people would now be horrified at the thought of two little girls sitting outside a pub in our best dresses, next to a road, engaging every stranger who came for a drink in conversation - while trying to be terribly charming in order to up our sales. To be fair, our parents did pop out to check on us and we knew a lot of the regulars. I have to admit it didn't always go well - I still have the scars from a spectacular fall in the car park involving a broken glass and a trip to A&E. 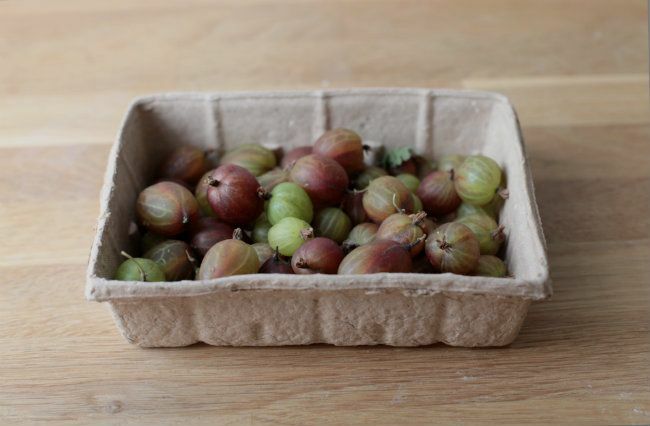 One of my other memories from H's garden is of eating raw gooseberries. We picked them off the bush, bright green and hard. They were incredibly sour but we ate some anyway, to prove we could. I couldn't remember when I'd tried them since, so I bought a punnet to experiment with. After a few conversations on twitter, I settled on trying to roast them as I love roasting rhubarb, which is pretty similar in flavour. They are very sour - you could add more sugar if you like. 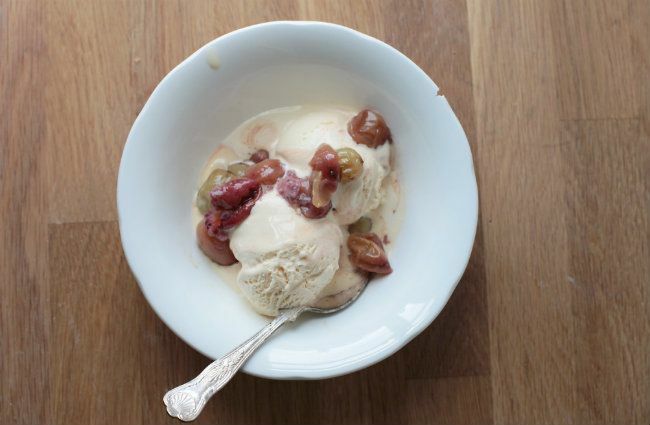 I decided to pair the sour berries with a honey ice cream inspired by the one I ate at Chez Panisse. I adapted a Lavender - Honey recipe from their book. 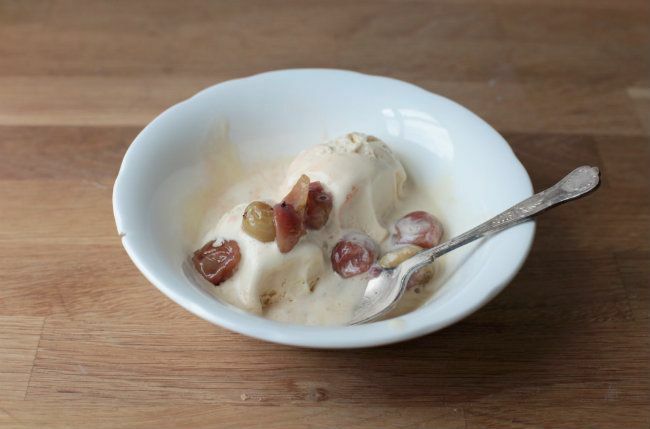 Topping a few soft scoops of the sweet ice cream with the warm, sour berries and their syrupy sauce creates a wonderful contrast as they start to pool together in the bottom of the bowl. The ice cream is made with a custard base. If you're nervous about making custard with egg yolks or just want some tips, try having a look at my Foundations post. Place the cream and milk into a medium saucepan. Break the yolks up with a whisk in a small bowl. Heat the cream until it begins to steam then turn off the heat. Pour about 1/3 of the hot cream into the egg yolks, whisking the yolks as you go. Scrape the yolk mixture into the pan. Use a wooden spoon to stir the two together. Turn the heat on to medium-low and stir until the custard coats the back of the spoon - you should be able to draw a finger through the custard on the spoon and see the line. Stir in the honey. Transfer to a jug and chill overnight or for at least 3 hours. Churn according to the instructions for your ice cream maker then place back into the freezer. Preheat the oven to 180C/350F. Nip the little brown bits off the tops of the berries and remove the stems. Place them in a tin (they need a bit of space to caramelise) and sprinkle the sugar over the top. Toss them together with a spoon or your hands. Place into the oven and bake for 20 minutes or until just burst and caramelising around the edges. Scoop some ice cream into each bowl (the honey means that the ice cream freezes softly, so no need for it to stand before serving). Spoon some of the berries over the top - don't add too many or you'll end up with too much sour in each bite. *This is the original ratio from the book - it's perfect to counteract the sour berries, but as a general ice cream I think it's a bit sweet. I'd probably try 75ml or so if I wanted to eat it alone or with sweet fruits - though a slightly sour punnet of raspberries were delicious with this batch. 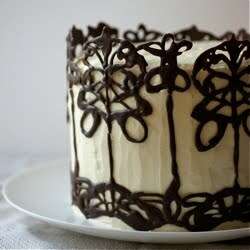 I used orange blossom honey. That looks like such a divine combination - I will definitely be trying it! There is something about gooseberries that just seems to sum up an English childhood isn't there? 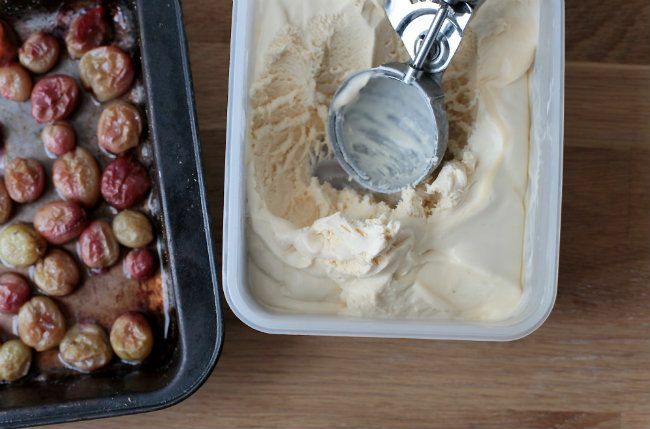 I'm not sure I've had any for years but I love this idea of roasting them alongside the sweetness of the ice cream. A perfect summer bowl. I'll definitely prepare it! It looks delicious! Hi there, this looks like a delicious combination, I will have to try it! Beautiful photo of the gooseberries too! What a wonderful story of your childhood and as I read I thought of mine growing up tropical North Queensland, Australia. It too was carefree and quite unsupervised. A far cry from children growing up today. Thankyou for rekindling some wonderful memories. BTW I have never had gooseberries but I remember them from the English stories I read as a child. Beautiful post! Lovely, emma! I wish I could find gooseberries around these parts. 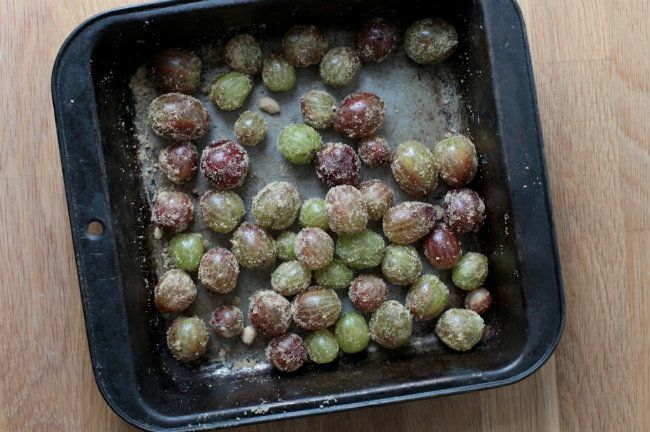 this recipe brings me back to my childhood... my dear granny used to make gooseberry jam and I loved it. 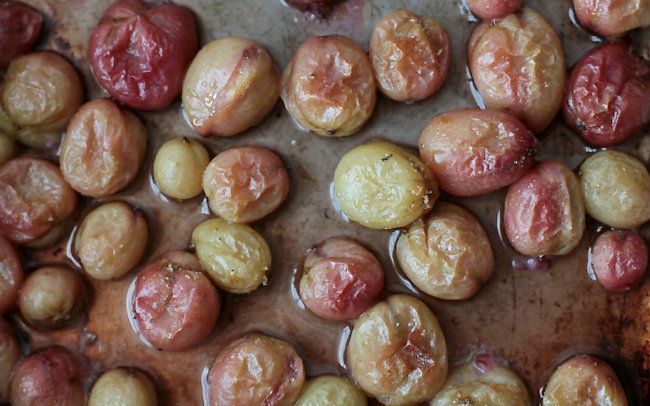 I have never made anything with gooseberries, but I am totally intrigued. Kezia - It's a great combination - honey is so sweet it needs something sour. Hope you enjoy it! london bakes - Exactly - for some reason they're very evocative. Possibly because they're not terribly common so your memory isn't constantly provoked? Aurélie - I hope you do make it - and enjoy it! Marcellina - I'm so glad my words brought some of your memories to the surface - it's lovely to think back once in a while. They're funny really - so sour. But definitely worth trying if you ever find some! Liz B - Ooh lots of people have been mentioning gooseberry fool to me - I'd forgotten all about it. I guess you have to get the balance and sweetness right. I hope you do try gooseberries again - it's always interesting to see which childhood preferences stay with us into adulthood. Rose Taylor - Gooseberry jam sounds like a great idea! Nice to hear they evoke memories for you too.